Everything in Paul Schrader's life has lead him to this moment; all his time spent in the seminary, his adoration (brought on by his brief career in film criticism) for the directors Yasujiro Ozu, Robert Bresson, and Carl Th. Dreyer, as well as his own prolific career as a screenwriter and filmmaker (particularly Taxi Driver and his solitary man films) culminate to a beautiful, albeit ominous head with his stunning modern masterpiece, First Reformed. The film is a thoroughly engrossing slow burn that gives you much to chew on, including its momentous final moments, and it has the potential to quite literally leave you shaken. 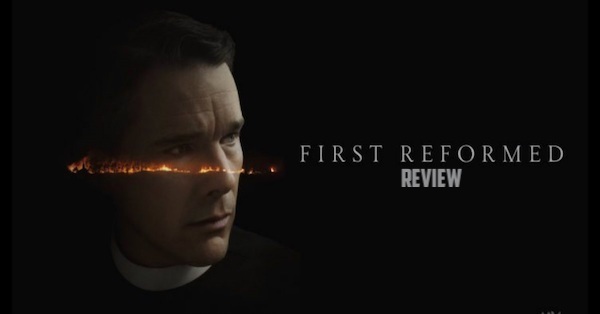 One of the best things about First Reformed — and there are many fantastic aspects — is how unexpectedly the story unfolds and presents itself. Even when you begin to think it's a particular type of film and that it's going in a finite and predictable direction, Schrader remains a step or two ahead and naturally pulls the narrative into a new and surprising direction. This aspect alone makes the film fascinating to behold, but when the concepts of hope and despair are introduced and presented in such an inextricable fashion, the film becomes all the more encompassing. The teetering between hope and despair is a key theme, and we focus on the modulation of these two extremes as seen from the viewpoint of Toller (played wonderfully by Ethan Hawke), a 46-year old reverend who is crushed by the death of his son and his crumbled marriage. Toller has opted to record a journal for one year's time, which, upon completion, will promptly be destroyed. It's through the journal, conveyed in voiceover narration, which Schrader uses to masterful effect, that provide us an intravenous gateway into Toller and all of his inner turmoil. However, it's not until Toller meets with Mary's (Amanda Seyfried) husband Roger (played by Van Hansis), an environmental activist pushing for Mary to abort their unborn child, that we truly come to understand Toller and his position. The conversation that occurs between Roger and Toller infects Toller, dragging him down a sinister rabbit hole where all of his abjection and despondency begin to manifest. The parallels and comparisons to Schrader's other masterpiece, Taxi Driver, which he wrote for Marin Scorsese, are absolutely just, and First Reformed takes on a Bickle-esque mentality more and more as it pushes closer toward its spellbinding final moments. There are even several direct visual references from Taxi Driver that Schrader intentionally embedded into First Reformed, and in a lot of ways, First Reformed is a more modern depiction of the Bickle's psychology disposition. After all, Bickle didn't have the internet so readily at his fingertips to see just how bad the world's situation has truly become, and even then, the global situation wasn't as bad in the 70s as it is nowadays. Toller isn't afforded this kind of ignorance and is illuminated by Roger's environmental activism and the information available online to the point that he no longer has a blind eye to turn. The acting is sparkling across the board, but Hawke is at his best and delivers his most memorable performance to date. Cedric the Entertainer (credited as Cedric Kyles) and Amanda Seyfried also provide phenomenal supporting performances. Each of their characters embody a different spectrum of hopefulness or optimize that is perfectly counterbalanced by Hawke's Toller. The script is flawless, and Schrader takes his time to carefully set up the pieces (or to let them unravel), but absolutely no time is wasted. There is zero fat here, and even when something feels out of place (like the scene late in the film's third act where Toller shows some elementary school children the church's trap door used for the Underground Railroad), it's really all necessary for sake of the bigger picture. Schrader shows powerful restraint in his direction, which consists of primarily static camera shots with minimal movement, and his use of the obscure 1.37:1 aspect ratio fits the story impeccably. The condensed ratio boxes the film, making it feel more claustrophobic, and it helps accentuate the angular aspects of the framing. It also allows characters to easily dip in an out of the frame, which often times reveal characteristics in the background (like Roger and his office wall, which is covered and pinned with environmental data) that subtly provide layers to the characters. The film's beguiling ending scene may leave many mystified; however, I feel that it's the perfect ending to a perfect film, and it makes sense when deconstructed. Ultimately, First Reformed asks us to chose what kind of world we live in; one filled with hope or one dominated by despair. It's a profound, provocative piece of art that is as sharp as it is bleak, and it's an experience that lingers long after the credits roll. I strongly encourage everyone to see this film on the biggest screen possible. Rating: 5 suicide vests outta 5. What do you think? Did you love the film? Did the ending work for you? We want to know. Share your thoughts and feelings in the comments section below, and as always remember to viddy well! Mini-Review: Won't You Be My Neighbor?